Beautiful Jim. A reminder that those of us who are overweight and have bad knees are given that great “gift of a chance to play and, once in a while, do it beautifully.” Thank you for this morning read. Good article Jim. Brings back a lot of memories, way back to seeing him around campus when he was a student at State. Beautifully said, Jim. Made my eyes water. 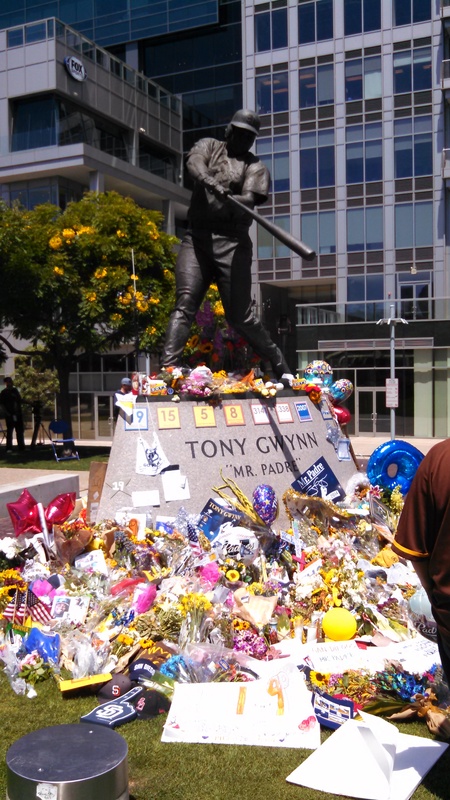 The thing about Gwynn was that he treated everyone he met with respect. This speaks well of his upbringing. He was always trying to be helpful and pleasant. You can view this from a Christian perspective, you can view it from a Buddhist perspective, you can view it from a perspective of no particular religious point of view, of Gwynn just trying to be a decent person. I haven’t read so many complements, true complements, about a person, since, I’d say, George Washington. Is it hagiography? I don’t think so. I think that’s who the man was. We would all do well to imitate him, even if our prowess with the baseball bat is not the same (and that prowess of his was hard-earned; yes, he had a natural advantage with 20/8 vision, but he was always working to improve his hitting). Very well said. I tend to downplay adulation of media stars and baseball guys are that but when there is a singular thread of ideology it makes a difference and Tony had and ideology he was projecting. It was a good one. He did not have to do it but choose it and that is potent. Its a soft one, homey stuff, I did good and you can do good, work at it and it works, it all applies to everything and produces great artists, musicians, writers, bricklayers, mechanics, tile layers, it don’t matter its kinda basic to the whole game. Kinda like an Aristotelian at home base. Just hit the little ones and keep doing it and it adds up. Jim, I think you found the words to make us smile and remember Tony and also get that lump in our throats with your anecdote about what a gentleman he could be on the field with an obnoxious heckler or with his many fans, waiting in line for a word and autograph. Your column writing here “reaches that perfect moment of grace,” that you talk about in life and baseball, where the words “all come together,” and you “just do it right.” Thank you!